POLYGLOT is one of the most prestigious language schools in the Czech Republic. Since its establishment in 1989, POLYGLOT has opened 8 branches in all the major cities of the Czech Republic which provide professional language instruction. Come and teach for Polyglot! Polyglot is looking for native speakers of English to teach both company and in-house courses. We’d like you to be passionate about language, motivated and eager to improve. We provide our own teacher training programme, offer a lot of courses to choose from and will give you excellent admin support. For more information, please, click here: Praha • České Budějovice • Ostrava • Jihlava • Brno • Plzeň •Liberec. 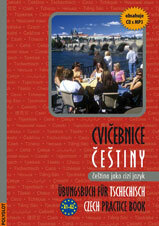 Cvičebnice češtiny is a modern practice book for all those interested in learning Czech as a foreign language. POLYGLOT is a testing center for the Pearson Language Assessment. Students can now take the internationally recognized exam at our school. POLYGLOT was awarded the Test Centre of the Year in 2008.